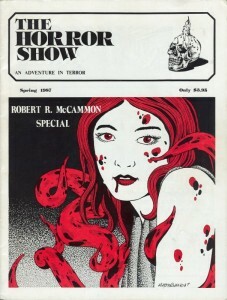 The Spring 1987 issue of The Horror Show magazine was a "Robert R. McCammon Special" issue. In addition to an excerpt from Swan Song, a review of the novel, and an interview about it, there was an article entitled "Fragments of Horror" that presented excerpts from various works-in-progress by McCammon. One of these works, the short story "Something Passed By," was eventually published, but, sadly, the rest of them have been lost and will never be completed or see publication. For several years, McCammon worked on The Lady, a novel about a 120-year-old black woman, but never completed it. Years later, the Lady did make an appearance in Boy's Life. There I was, a child alone in the swamp, and I think I must've gone crazy for awhile because all I can remember doing is crying and curling up in a tight ball to sleep. But my sleep was torn by nightmares of LaRouge and her monkey, and the way my Mama had died. I don't know how long that went on; the days and nights just tangled all together, 'til sun was moon and moon was sun. I do recall being jarred awake by the sound of an explosion, and I sat up and screamed because I thought it was the noise of Gator Leon's shack blowing up. But it was just thunder, rolling across the swamp. Lightning flashed and the thunder boomed again, getting closer. It started to rain—fat drops that smacked my face and ran through my hair. Thunder shook the world, and I lifted my face to the storm to let it wash the tears out of my eyes. I was my Mama's daughter, kin to the Lady of A Hundred Hearts and spirit-daughter of Damballah. In my body flowed the blood of African queens, of great warriors and sorcerers. I was a human being, and I had sense and strength. Why then should I sink to my knees under a little rain and wait for Death to take me? No! I knew who I was, and I decided in that moment—right then, as the rain swept down and the lightning flared like a world on fire—that I would somehow survive the swamp, that I would live to reach New Orleans, to find out the secrets Mama had hidden about both myself and her—and to find LaRouge and deliver justice for the murder of my mother. I looked in the direction of No Town, many miles away through the night, and I impressed the memory of LaRouge's hateful face in my mind. "Today for you," I whispered. "Tomorrow for me." The first draft of Usher's Passing covered the history of each generation of the Usher family. In this scene, Aram Usher visits his aunt Madeline in San Francisco. It was clear to him that she had another passion besides rich candles and rum cakes. A profusion of canaries flew about the apartment in a flurry of feathers, and their white splattered greetings lay everywhere on velvet sofa, finely carved chairs, and marble-topped tables. The damnable birds circled Aram's head, twittering and chirping with a noise that drowned out the ruckus of Barbary Coast hooligans, clattering carriages and hooting harbor steamhorns. He thrashed at them with his hands, and received white droppings on his palms. "So you're my nephew," Madeline said, her mouth with its huge red lips moving around a moist rum cake. "My God, boy! You look like a good strong wind would knock you to China!" Aram gave up against the canaries. He faced Madeline, and he said what he'd come a thousand miles to say: "I want to know why you abandoned Roderick." Her chewing ceased. A little laugh tittered out, and with it the smell of rum. "Because," she said with a pout, "he wasn't any fun." She slapped the cushion at her side. "Now come give your Aunt Maddy a great big kiss!" The figure glided forward; it was a large figure, broad-shouldered and thick. The body of a man who had worked hard for a living, had endured a life of winters. Still, for all its size, the body glided across the scarlet runner—and stopped, just at the lamplight's edge. There was a soft laugh, like wind between icicles. "You're nothing but an old man," the voice said, in the Hungarian high-country language. Beside him, Tom Chandler slowly lowered the machine-gun; it was useful against the Soviet troops, but not against the creatures standing before them. "Your choice," the Countess Bathory said, with a dark smile. "Which one will you have?" He was sitting on the front porch in the steamy heat of mid-day, sipping from a glass of gasoline, when the doomscreamer came. Of course, doomscreamers were nothing new; these days they were as common as blue moons. It came to him, just like that: it was the lost chord that did it. Whirlwind could play. It was the lost chord that brought Jinny back from the grave with needle holes in her arms and a sick fascination in those sunken black eyes. It was the lost chord that had roused Nick Paisley, stirred up Blackbeard, brought Gordy back from Hell with his face still scarred by a motorcycle's tread. It was the lost chord that made the dead want to dance again—only to Whirlwind's music. Only that. He popped open the guitar case. It was such a beautiful instrument. Its strings still had blood from his fingers on them. There was a knock at the door. A soft tapping. He dropped the lid back and snapped the latches. "Baby?" It was Jinny's slow, labored, underwater voice. "Baby? I'm hurtin'. Let me in, baby. I'm hurtin' so bad." "Go away," he whispered, but he knew she would not. Not this time, nor the next. "Please go away." And even as he said it, he picked up the butcher knife and took a step toward the door. "I love my baby," Jinny crooned, and air gurgled in her diseased vocal chords. "I love you too," he answered. His hand closed on the knob. Brother Terry was a joker. Booker K. Grief, could he throw the place into a spin! It was Brother Terry who was always taking chances, always making faces behind the backs of the Nobles, always going out on a limb to make us black-robe boys laugh. I remember he found a way to the roof, and he got me to go with him. I didn't want to, Dizzle, no! But I did, because he was such a fast talker. Maybe Nobel Lucius was right; maybe there was a touch of Satan in Brother Terry. Maybe. Anyway, we got up through a hatch to the roof one night, and we could see all of Beulahland from that height. What a daz! The searchlights were going back and forth over the wheatfields, and I swear those lights never looked so pretty! I mean, they were celestial! We could see the worklights on way out in the fields, too, and the trucks where the night shift was working. And the stars—mighty, mighty stars. I'd forgotten what the stars looked like, because I went off night shift when I turned eleven in the Ninth Year of Our Lord. But we were up there real dazzing high and here it comes—God's Eye. We could hear it, like a sewing-machine's hum. Brother Terry says, "Get down! Flat!" I did, real dazzing quick, and God's Eye passed maybe thirty yards away from us, heading west over the fields. Its spikes were sticking out, and I figured somebody had jumped the wire out on night shift. Yeah, somebody was going to get a shock that night. I never found out who. Anyway, I sat up and watched God's Eye speed away, and Brother Terry says, "I'm not scared of it. Are you?" "No," I answered. But I was lying, and we both knew it. Brother Terry was a real joker. I wasn't surprised when they took him out to the Wall one day about a month later and shot him. I said, "Praise the Lord," as the guns went off, just like everybody else, but I had the taste of cinders in my mouth, like burned-up stars. Copyright © 1987 by Robert R. McCammon. All rights reserved. These fragments originally appeared in the Spring 1987 issue of The Horror Show magazine. Reprinted with permission of the author.